This week, Robert and I discuss The New York Times’ business model – and why its future could be very bright. We also explain how the fake news crisis could be creating an amazing opportunity for brands, and prepare for some big media company acquisitions by brands. Rants and raves include a Pixar training course on storytelling; then we close with an example of the week on John Yocum Beaty. How is The New York Times really doing? (10:23): The Gray Lady’s struggle to transition into a digital-first publication has been the subject of a lot of media speculation. But how far off is it from reaching its lofty digital business goals? GigaOm founder Om Malik decided to investigate how the inveterate news publication is really faring, by the numbers. Naturally, Robert and I agree with Malik’s assertion that the Times needs to evolve away from advertising more aggressively than it has been – though we were shocked to see just how significant its dip in advertising revenue has really been. How fake news is making real publishers look good (19:27): Mequoda Daily ran an interesting piece on the ways reputable media outlets can distinguish themselves from the tabloid-y purveyors of fake news, such as avoiding shallow listicles, sound bites, and “you’ll never believe” titles and focusing on accurate, investigative news. There is certainly an opportunity for media companies to up their game in this respect; but the real opportunity I see here is for product brands to stake their claim by becoming the trusted news resource for the audience they cover. Magazine M&A speculation heats up (29:03): Speaking of media’s quest to remain competitive, according to The Street, a number of print magazines reportedly are on the block or are attracting acquisition interest, prompting some key media investors and consultants to weigh in on the potential for consolidation. While we are encouraged to see more analysts joining in on one of our favorite topics of conversation, Robert and I are left wondering why no one else is focusing on the opportunity for product brands to play in this space. 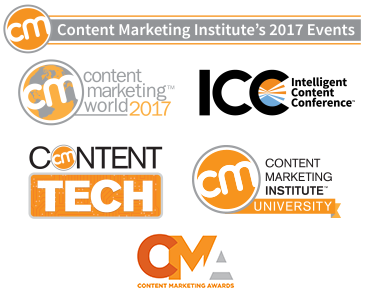 Content Marketing Institute’s 2017 Events: Whether you are just getting started with content marketing or are looking to take your expertise to the next level, CMI’s portfolio of events has you covered. 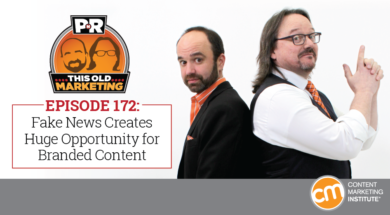 Open enrollment for the new semester of Content Marketing University started March 1. We are launching an all-new program this year, but it’s limited to 500 learners, so don’t wait to secure your slot. Use the code PNR100 to get a $100 discount on registration. Time is also running out to sign up for our strategy-focused Intelligent Content Conference ­taking place on March 28–30 in Las Vegas. And don’t forget that early-bird entries for the Content Marketing Awards are due by March 10. Send in your submissions, so your stellar content marketing efforts can get the recognition they deserve. Robert’s quick rave No. 1: Engadget has covered the news that Pixar is offering a free course on “The Art of Storytelling,” through online education platform Khan Academy. Robert is halfway through the course, and he’s finding it to be a delightful tutorial on the topic. He recommends it highly to anyone who wants some help finding his or her unique story and learning how to tell it more skillfully. Robert’s quick rave No. 2: Robert also bestows must-read status on an article in The New York Times, which talks about the cyclical trend of media bundling and unbundling. After years of bundling backlash and consumers looking to “cut the cord,” the pendulum is now swinging back in the other direction, thanks to vertical-integration successes like Amazon Prime. This article serves as a reminder that the content services we provide will need to go beyond the products and services our businesses offer if we want to remain viable in the future. Joe’s commentary: To Robert’s earlier point about Khan Academy (technically) being a competitor of our own online education experience, CMI University, I’ve noticed a trend that I feel compelled to mention: In my research on some of the successful brands that have found success by building a media platform – like Arrow Electronics, for example – I’m finding that the majority are actively soliciting advertising and sponsorships from their competitors. Though it’s a departure from the way many brands view their competitors, as I see it, if another business in your industry wants to help you build your influence, what reason would you have for turning them away? Joe’s rave: A few members of the CMI team have (politely) asked me to stop talking about Tim Ferriss already; however, there’s one more story I feel compelled to tell before I submit to their gag order (at least, for the time being): A recent episode of Ferriss’ podcast features Soman Chainani, best known for this popular children’s book series, The School for Good and Evil. Soman said his biggest goal when writing the book was not to have the most readers, but rather to have the most passionate ones. It’s great advice for any business that focuses on getting more audience rather than on efforts to strengthen its core audience. If you’ve been following our show for a while, you may recall that Robert once highlighted the story of Art Shaw, a businessman and entrepreneur who was the first editor of the Harvard Business Review. 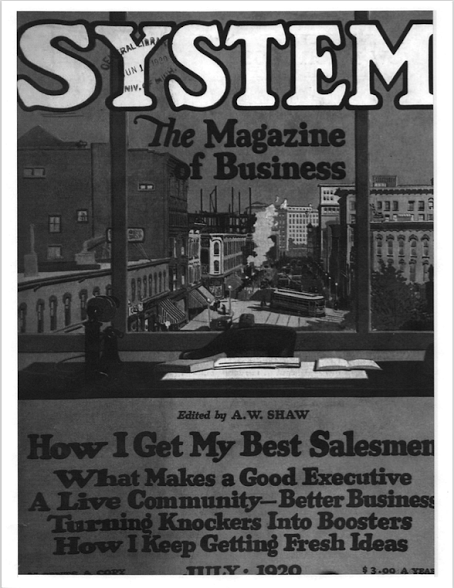 Shaw also founded System: The Magazine of Business, which provided business people with essential training and education information as a means of creating demand for his office-supply business. Robert recently discovered an article in an issue of System from 1920 called Meeting Customers I Never See, by John Yokum Beaty. In it, the author talked about the unique customer insights he had been able to tap into, thanks to the magazine he created for customers of his pig farming business. Even more importantly, Beaty applied those insights to develop new ways to answer his customers’ questions and meet their needs – even when those needs went beyond the scope of his own business. For example, he started to run free classifieds so his customers could advertise the surplus stock they had for sale; Beaty also ran paid ads from other manufacturers in his magazines, helping those businesses to bring their offerings to the attention of his customer base. Beaty described his efforts in terms of the important lessons they taught him about how to keep customers satisfied by providing them with useful, valuable information – a This Old Marketing principle that still holds true nearly 100 years later.